Warren McDougle, epidemiology manager for the Hillsborough County Health Department, says the flu shot apparently did a good job of covering the predominant strain, A (H3). But unfortunately, there's another mean virus going around, according to anecdotal reports. It starts out like an ordinary head cold, with a sore throat, sneezing, and runny nose. But where a cold lasts just a few days, this bug can trigger a chest infection. It can lay you out for two or three weeks or send you to the hospital. McDougle calls it a "non-flu respiratory infection." However, some people just call it "The Crud," he says. The telltale sign is a wet cough or wheezing, signaling an infection in the lungs. "The best advice is, if you have a cold or any illness that moves into your chest, any trouble breathing, any cough that produces any mucus or fever, seek medical attention," McDougle says. The doctor can test to see whether it's a bacterial, viral or fungal infection and treat it accordingly, he says. Above all, he says, keep it to yourself. Don't spread it to family, neighbors or co-workers. Even if that means staying home in bed, missing out on Florida's best weather. No case numbers are available on either the influenza or the Crud, since doctors are not required to report them. 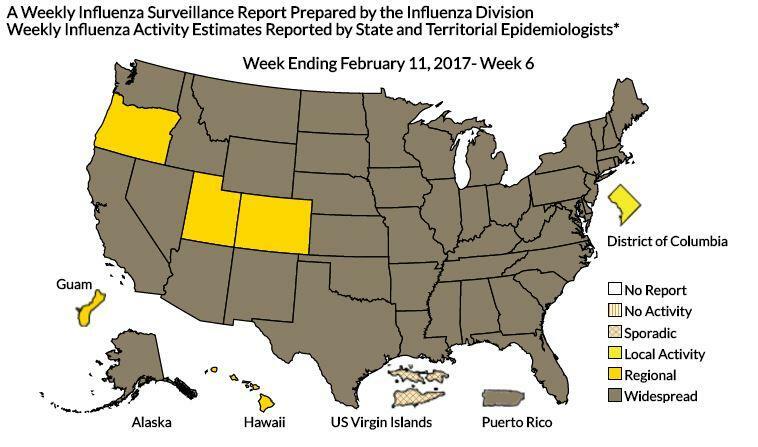 However, according to CDC's weekly surveillance report, through Feb. 11 there had been more than 8,200 hospitalizations and nine pediatric deaths this season, which began Oct. 1.